Hilton Head Island, South Carolina delivers all the ingredients for a magical stay; pristine ocean water, nature activities, and a boatload of inland fun things to do. You can't really go wrong with any of Hilton Head's eco-friendly activities including our main attraction, the beach. Located on the Intra-Coastal Waterway, Hilton Head Island contains 42 square miles of semi-tropical geography that locals refer to as the Low Country. The Island works hard to preserve the pristine natural environment which offers a relaxing, hospitable atmosphere. With few streetlights and rules prohibiting neon signs, Hilton Head has retained its Southern charm. Of course, con't miss the candy-striped lighthouse in Harbour Town, Hilton Head's famous landmark. It's a manageable 114 steps to the top. Instead, our golf courses, fine restaurants, luxurious resorts and exceptional villa accommodations are beautifully intertwined with our natural salt marshes, lagoons, blossoming magnolias, forests of elegant moss-draped live oaks, towering southern pines and palmetto trees - all surrounded by 12 miles of the best sandy beaches in South Carolina. 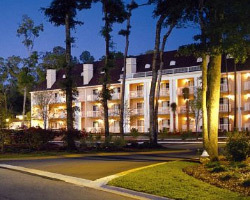 Hilton Head Island has a semi-tropical climate and is heated year-round by the Gulf Stream. The Island's average daytime temperature is a mild 70°F (21°C). The annual ocean temperature averages is about the same at a relaxing 69°F (20°C). Visitors to the Island can choose from a number of first-class resorts and hotels to experience it all. Ranked the #5 Best U.S. Island for Families, those of you have been to the Island understand exactly why we were chosen, and those who haven't had the pleasure of visiting, come see what you've been missing! Whatever the reason that brings you to Hilton Head for the first time, you won't be disappointed.